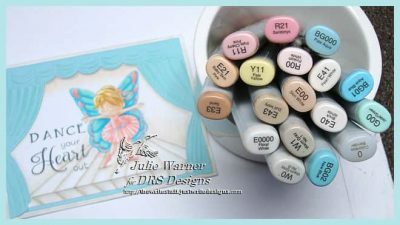 The challenges on Monday at Splitcoast are TLC631 (no line coloring) & CAS422 (winged things). 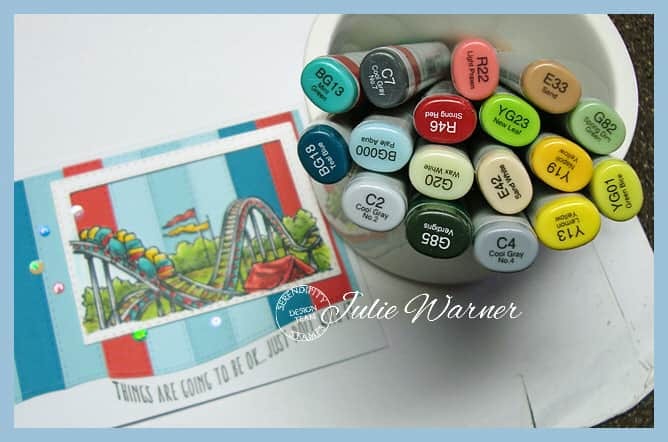 Hmm….I’m thinking maybe I should have just picked a floral to do the no line coloring. I’ve done it on ornaments & candy canes & it turned out fine, but this little missy was hard to do. Mainly because she’s so little & it’s hard to no line her & keep facial details. Anyway, I no lined her by using desert sand ink, colored her, then masked her & stamped the butterfly w/ lt blue & colored it. Without having this in my Misti, it would have been impossible. Since the ink is the same color as the Copics I was using, I had to stamp her several times while coloring just to find the edges again. 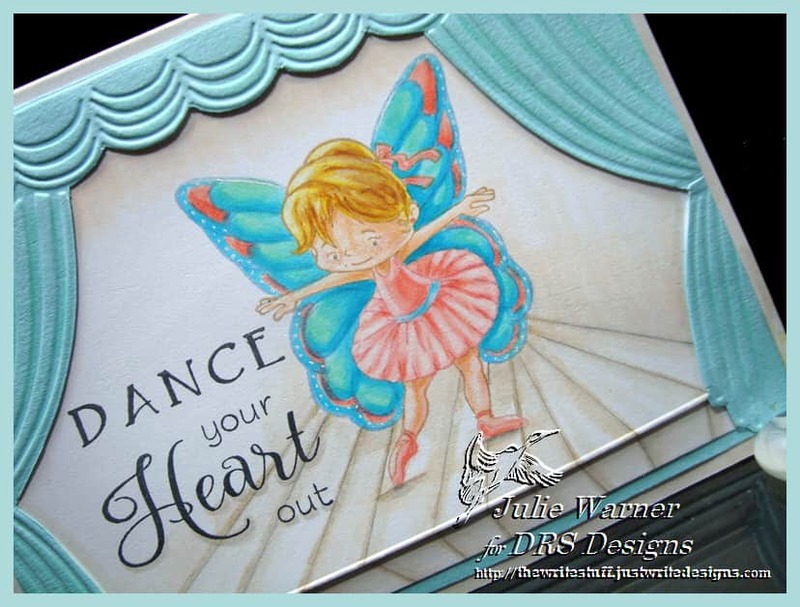 I was so impressed by Nancy Williams card Here & the floor she drew that I added a drawn floor. 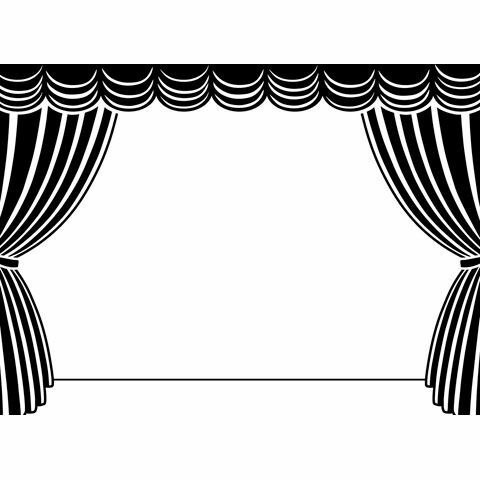 The curtains were dry embossed, cut out & added on top. 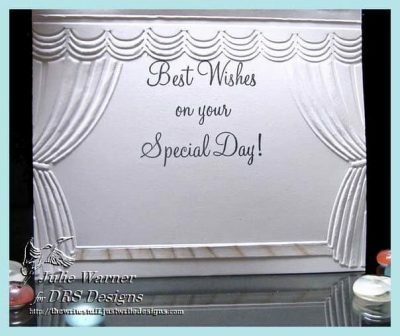 It’s my turn to host the Featured Stamper Challenge (FS529) on Splitcoast so a big congrats to Hideko Lagan, aka PapercraftBoutique! She has a really sweet gallery & I chose THIS to case. 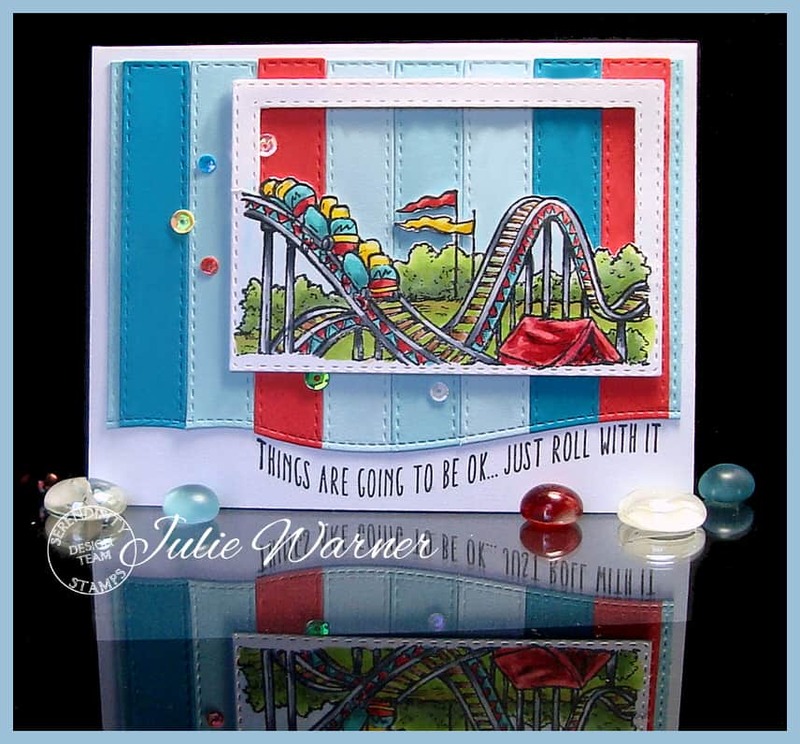 I liked the colors & the pieced strip bg so I kept that but I used different images, different dies & turned my horizontal. Hideko was brought to my attention by the very sweet Kia…thanks, Kia! 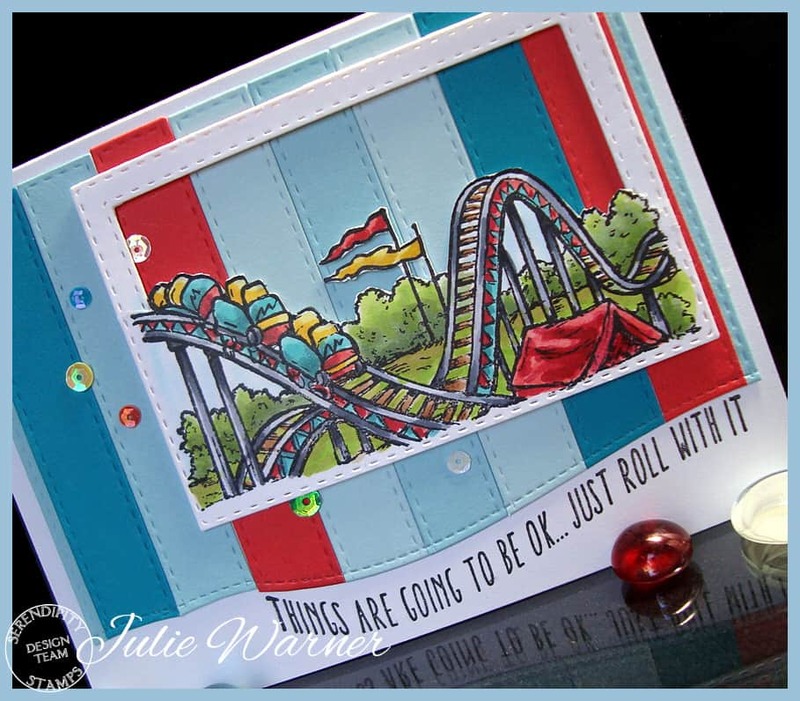 To make my roller coaster card, after stamping & coloring the image, I used a double stitched die and my into the window technique. All of the strips in the background were die cut w/ one of the smaller sizes of the stitched long & skinny mats, then I arranged them & used scotch tape on the back to hold them together. I used a curved stitched die that closely followed the greeting curve, to cut the bottom of the strips then I attached them to the card front. I attached a bunch of leftover pieces & strips to the back side of the framed image to give it a little lift. Some sequins were added for a little sparkle. Here’s a look at the inside, using more strips & below it are the Copics I used to color the image. 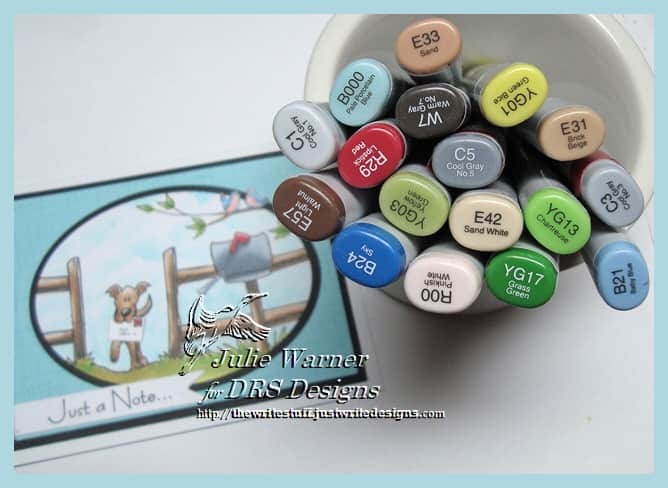 Today’s Ways to Use It Challenge (WT628) is a tribute to National Puppy Day. 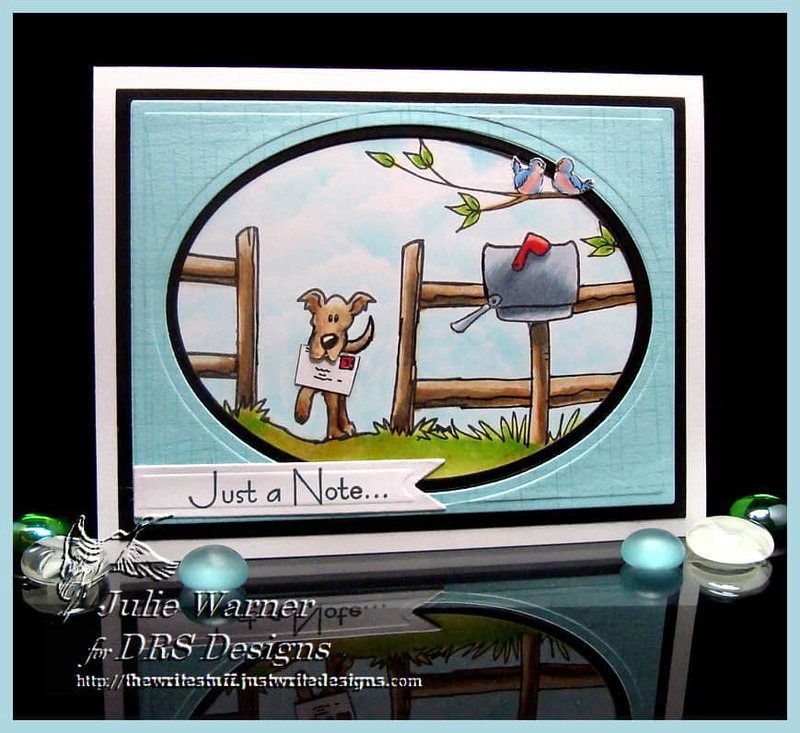 While I don’t have a dog in real life, I do have a cute one on my card & he’s learned to put mail in the mailbox. What a champ! And on the subject of dogs…the last dog I had was a blonde cocker spaniel named Tigger. We also had a conure (parrot) we named Odie. We called him Odie (after the cartoon dog on Garfield) because he thought he was a dog. He learned to bark from Tigger, but his bark sounded kind of far away. We realized he was imitating the dog when he was barking from the back yard. The parrot we have now is named Linus (after the character on Charlie Brown). He also barks because he learned it from Odie. Guess I also have a thing for cartoon characters, lol. Here’s a pic of Odie on his favorite cup. 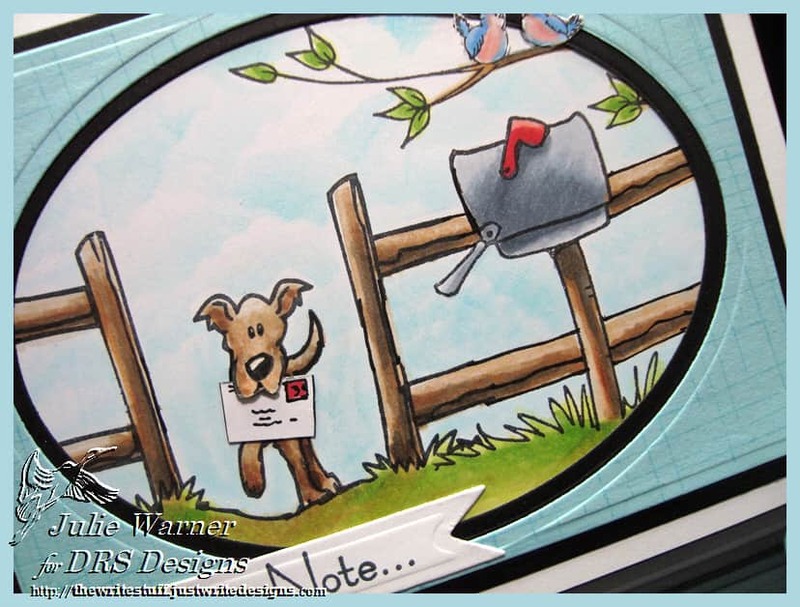 To make my mail dog card, I put together 3 different images..the dog w/ the fence is one. Originally he had a big stick in his mouth but I drew a letter to replace the stick. The lovebirds on the branch is another & the third is the mailbox, which originally had a big smiling daisy w/ a letter in its leaf. So there was some masking going on here. 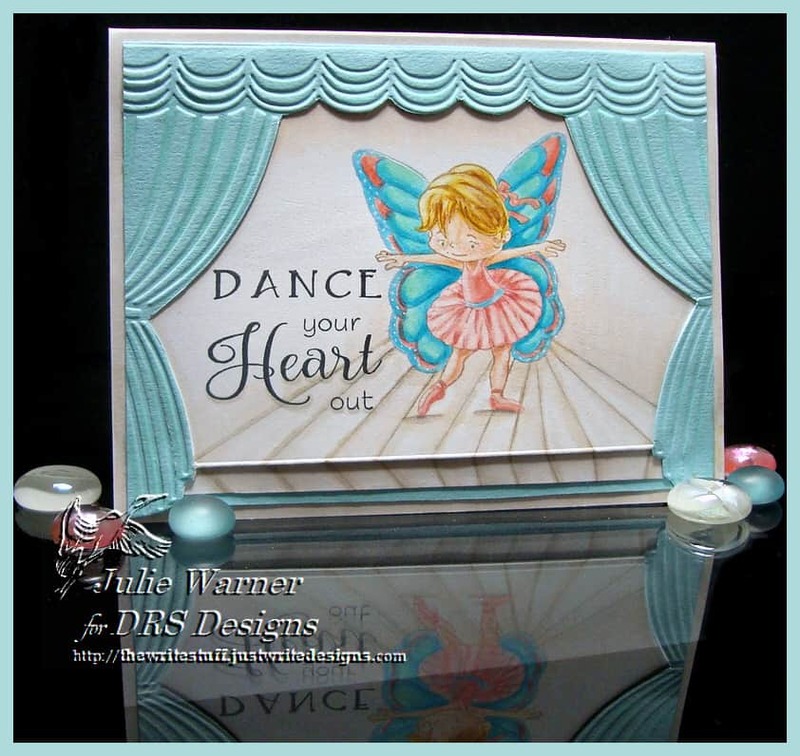 After I colored everything, I used a self made cloud stencil & sponged in the sky, & stamped a lines bg, tone on tone on the blue frame.